The world has gone mobile. It has become a “must have” element for any organization, regardless of its size. Undoubtedly, some organizations can concentrate on only one mobile OS (operating system) and avoid all the other ones; however it’s vital for several businesses to specialize in a myriad of mobile devices with various operating systems. Gone are those days after you were satisfied with only having a mobile app. Today, it’s vital that the app should support android gadgets, iPads, Windows Phone, Amazon Kindle, Tabs, BlackBerry, etc. With careful planning around 50%-80% code reuse is accomplished across-platforms. This results in faster development and reduced costs. Cross-platform development provides more advantages during the maintenance period. If a bug is found in a common code base it must be fixed just once. Unit tests are required to be written just once for the common code, hence the saved budget is used to write more thorough unit tests. It is possible to use existing programming talent rather than learning platform specific developed technologies. In general, phones are not as powerful as desktops when it involves raw processing power. Many mid-level and entry level phones don’t have enough hardware power to perform smooth HTML5 animations. Because of this HTML5 hybrid apps will cause sluggish UI on low and mid range phones. Also since browser components have evolved with the operating systems, it’s relatively painful to support operating systems which are quite 3 years old. Rendering modern HTML and CSS which uses advanced features like gradients requires a lot of CPU and GPU resources. Thus, HTML5 based apps consume significantly more battery compared to native apps or native cross-platform applications. Usually, HTML5 hybrid apps depend on callback-style programming to communicate with native plugins, which makes the code unnecessarily complicated. also, for some tasks, this might lead to impractically slow solutions. Native cross-platform app SDKs are not mature yet. Many successful apps are developed as native apps (either android or iOS) because designing and building an app for multiple platforms with platform-specific user experience is too difficult. This is due to all platforms defining their own human interface guidelines and supporting them with a single code base turns out to be very challenging. 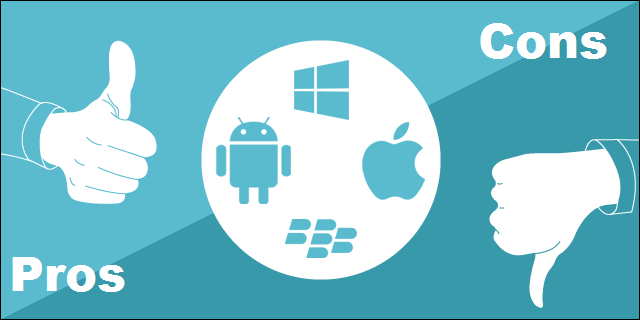 Mobile operating systems are evolving at a very rapid rate. Every year there are more and more features being added.